When Sis and I had been out fabric shopping together last year, we'd spied a really lovable animal panel print that we'd each bought. 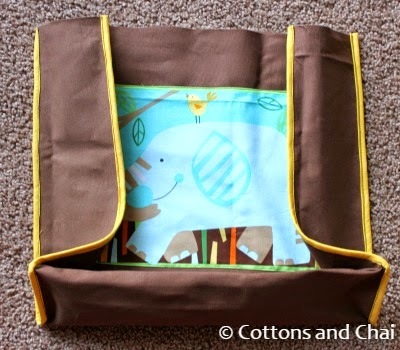 While Sis chose to make this beautiful quilt out of hers, I'd wanted to make a largish bag to hold my son's snow pants, extra clothing sets and other paraphernalia for toting around, so decided to pull out the panel I'd been hanging onto until now. 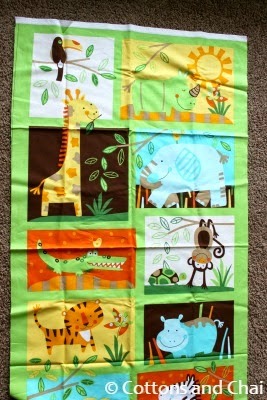 What follows is another way to use those cute little animal print blocks! This tote is a simple, unlined bag made of 3 main pieces - one rectangle that makes up the front & back and two rectangles that make up the sides. The base is accounted for in the main rectangle. 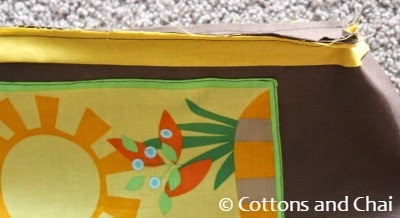 I did not use a lining because the fabric I used was home decor weight, quite heavy duty. Also, even without the lining the raw edges do not show up because of the binding on the borders. c) on one corner of the panel, so that the rest of it is still preserved well. I sewed them up on the front and back areas, leaving out more space on the middle since that would become the base of the bag. 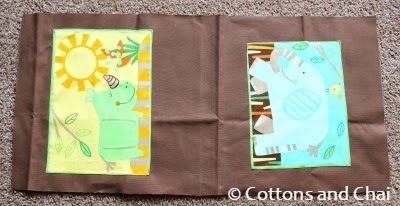 Notice that they are facing opposite ways to end up right side up when the fabric piece is folded over. Next I pinned one of the side fabric pieces to one edge of main bag after cutting out 2 strips of contrasting yellow fabric. And here it is sewn together such that all 3 raw edges are together. 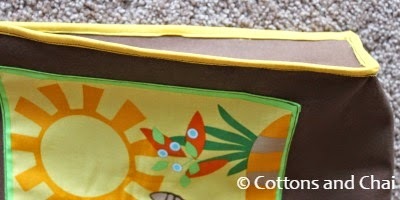 I folded the yellow fabric over and stitched through again to bind one side of the bag completely. Similarly I sewed the other side. 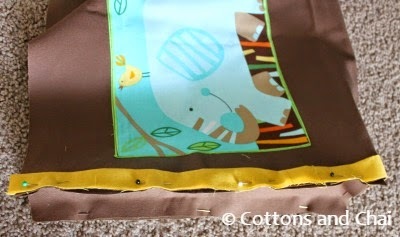 In the same way I used one more strip of yellow fabric to bind the raw upper edge. 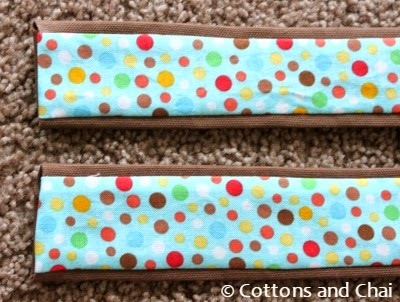 Next I cut out 2 strips of brown fabric and 2 of a coordinating multicolored one for the handles. Notice that the brown fabric is wider than the printed one so that it bulges a little once I've sewn them right sides together. This is because once turned right side out I want a little brown border running down the sides of the handles. You'll see what I mean in the next picture. There! 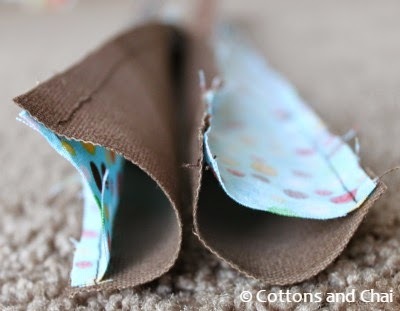 The handles have a bit of brown encasing the print. See what I mean? 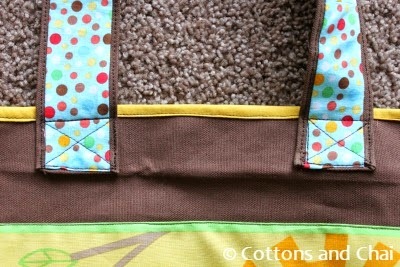 Next I sewed the handles onto the bag. Voila! 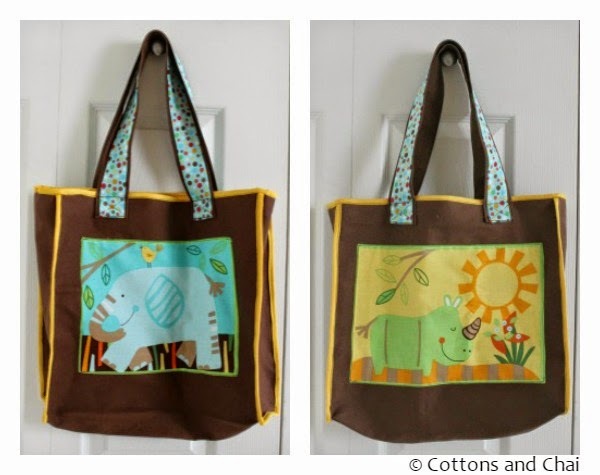 Animal tote ready for holding all! Wonderful. Thank you for a new way to look at panel pieces. 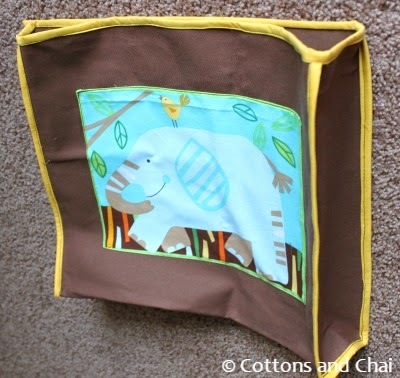 Wow, that is one fun tote! very creative use of the panel print. 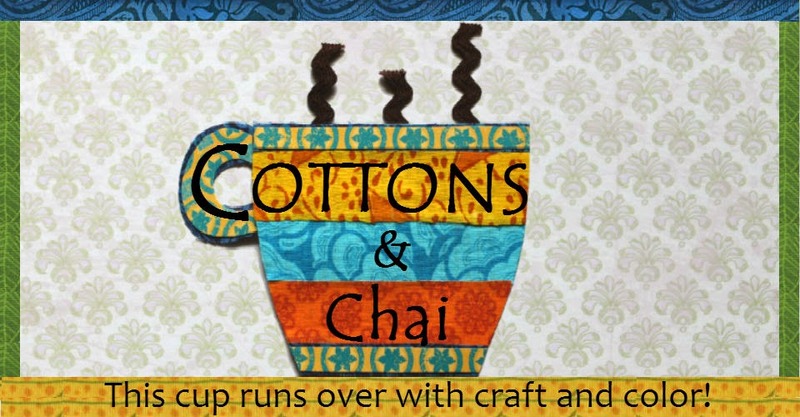 Quilted Pouches - A vote of thanks! Spectacles Case - Rest those tired eyeglasses!